Tootling down Watton Street looking for a carpark, I am bemused. But not nearly as bemused as Bennie and Deb, his mum. At issue is the nature of our destination – seemingly the sort of pub that would normally struggle, and fail, to gain the attention of CTS. A confession: I have been seduced by the nice Facebook pictures of the Commercial Hotel’s food, these featuring occasionally in my feed because of the joint’s links with the Werribee Bears rugby league outfit. I’m not diehard fan of the club, but did venture down there for a couple of games last season. Even if the pub at hand would normally fall out side CTS paramters, we are – as ever – upbeat and hopeful. Truth is, had I twigged the Commercial is a pokies venue, this adventure almost certainly would have been stillborn. Happily, the pokies are well away from the dining room – out of sight, out of earshot and out of mind. That leaves us to happily enjoy the old-school ambiance. The Commercial’s dining room feels – from the carpet up – just like a country pub. As we expect, the menu (see below) is studded with the sorts of dishes routinely found in such places. But there’s a few nice wrinkles in there, too. 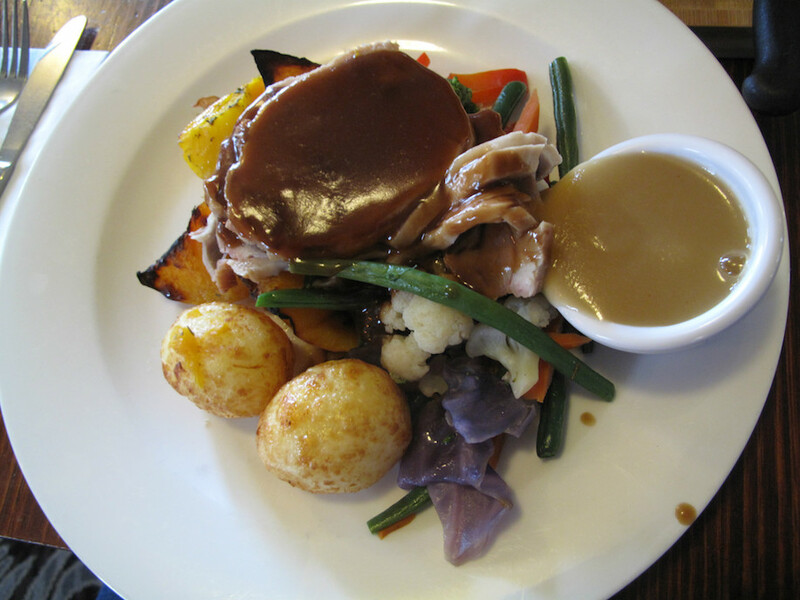 Deb goes the roast pork dinner ($13). It’s a beauty, with a heap of good vegetables and more than enough highly porky and nicely cooked meat. She loves it; the plate is clean when she’s done. Not just a fine roast dinner, but a bargain as well. For Bennie, it’s the pulled pork burger ($20), which tastes a lot better than it photographs. Oddly (perhaps even weirdly), the pulled meat appears to have been formed into a pattie. It tastes good to me and he enjoys it. But it’s fair to say Bennie has just about had it with pulled meat of any kind in burgers; me, I’ve had it with pulled pork period. It’s a subjective judgment, but for me the stars of our collective choosing are my BBQ baby back ribs ($33). There’s two good-size rack pieces in there. The meat is tasty and tender, and comes from the bones with ease. I know there’s people out there, for whom gnaw is the desired and happy norm, who will think that no recommendation at all. Still, for me this is a fine BBQ meal, the pricing of which can put some of the specialist BBQ joints in the shade. The ribs are handily abetted by a fine slaw. Really, the only disappointment of our Commercial outing is the chips Bennie and I are provided. They’re OK – but also under-done and under-salted. 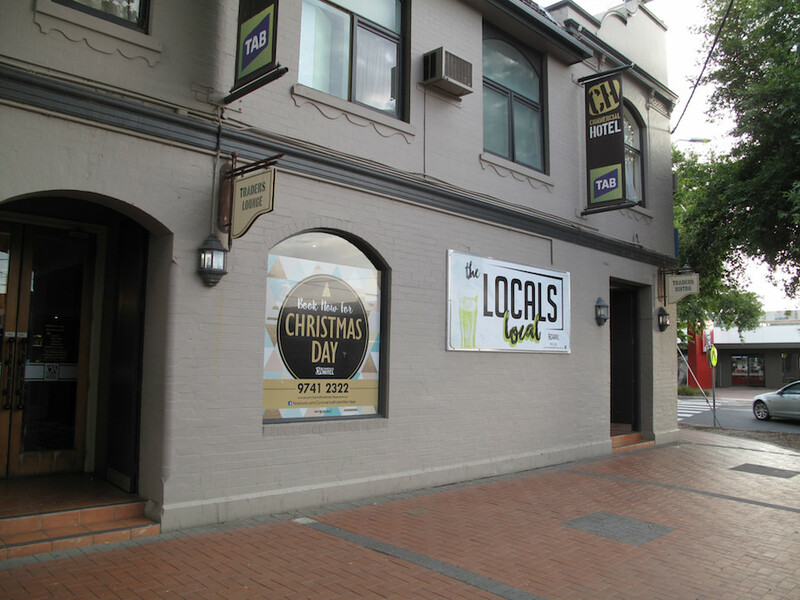 Check out the Commercial Hotel website here. There is a new restaurant called “New Favorite Chinese Restaurant” in St Albans, where the Hong Kong Noodle Bar used to be. Would love to see a review.